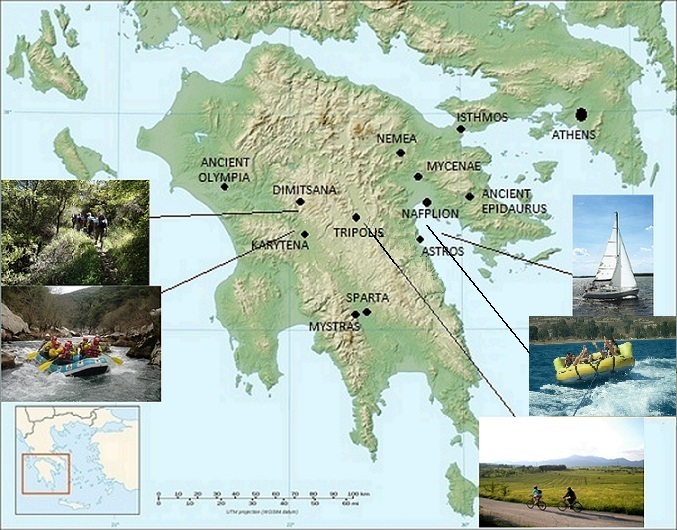 Multi activity holiday in Greece. Helping Dreamers Do. More info:Price includes: Accommodation for 7 nights with breakfast, transportation,activities,3 meals,tickets for sights,museums and caves. Exc flights.Single supplement €135. Recommended min age: 7yrs. Some people seek out Greece holidays where all they have to do is crash on the beach, and others want to explore through adventure, activity and outdoor fun in the sun. And also in nature. This week long holiday in the Peloponnese ticks all of these boxes, offering an itinerary with a wide array of activities in the most stunning surroundings, both mountainous and coastal. This activity holiday is suitable for all types of travellers, whether you are solo, a couple, a group of friends or seeking the perfect Greece family holiday (minimum age for most activities is seven). Our itinerary revolves around the beautiful Peloponnese areas of Nafplio, Kalamata and Tripoli, each boasting a vast ancient history but also access to a natural playground. Our activities include hiking, biking, rafting, sea kayaking and other water sports such as water skiing or scuba diving, and in order to immerse yourself not only in the region’s turquoise waters but also its culture, we include a cooking lesson and wine tasting too. There is also free time built into the itinerary, so that you can explore some of the region’s famous archaeological sites, such as ancient Olympia, Mycenae, Epidaurus and Sparta, or indeed the Acropolis in Greece. Do contact us if you want to create your own personalised programme of activities and day trips, to suit your budget or time available to visit the Peloponnese and we will do all we can to help you. Bring a snorkel and mask. And plenty of eco and marine friendly sunscreen. Small group holiday. Max. 20 people. Min. age 7. 3* hotel or apartments, 5 nights in Tripoli, 2 nights in Nafplio. Accommodation, all breakfasts, transport, some meals, activities. Plenty of taverna treats to be had. All the activities included in this trip, are environment-friendly. We prefer using the power of the wind and the power of the water rather the power of gas and that’s why we don’t offer activities like jeeps or jet-skis. We are also owners of the small city hotel that you will stay during your holidays here where we recycle paper, glass, plastic and metal. At your arrival here you will be given a Travellers Code of Conduct, where you will get informed about how to apply maximum responsibility during your holidays concerning environmental and socio-cultural factors. As we are aware of the fact that your trip here will cause carbon emissions, we offer 1% of the price to the environment for offsetting them! This money is going to be used, in cooperation with the local Forestry Office, the Greek Trekking Club of Tripolis and the Tripolis Ecologist Club, for afforestation in our mountains, that have been hit by great fires in the summer of 2007. We hope that our effort will push other companies, individuals or local authorities to contribute to this project too. Choosing our holidays, you choose responsible holidays. As Mr Panagiotopoulos, founder and president of our company, was born and raised here, one of his biggest concerns is to secure that tourism will not affect negatively our area in ecological and socio-cultural way, and also that the locals will mostly benefit from your travel. Our company which is the organizer and operator of this package is local-based and all our guides, drivers, activity specialists and employees are locals too, ensuring not only the economical benefit of our area but also your cultural benefit. In this trip, you will visit so many different places and you will always be surrounded by locals, experiencing the Greek way of living. But what is most important for us, is that your presence here gives us a strong negotiation card for pressing the local authorities for the development of our area, such us constructing cycling streets in our city or finance and organize better our archaeological museums and sites. through the eyes of the locals and not through a glossy, commercial brochure. We booked a sailing day in Nafplio for the last day and it was amazing. We would definitely recommend this to other travelers. The sea was so glorious with all the shades of green, turquoise and blue and it was so warm that we spent the entire day in the water. countryside. Our guides were warm, friendly, knowledgable and competent. They really brought the group together and we all had a fantastic time. Bring trainers and wet shoes. Learning a few basic phrases of Greek goes along way. Always carry water. minimal.environmental impact and food was locally sourced. However getting to almost of the sites of the activities was dependent on road vehicles. It was a really good holiday, we all enjoyed it. We loved the variation, the hotels were all very good, and all the staff were exceptional especially our driver and host, Mikel; he was very understanding and thoughtful. We enjoyed his company. I would have given the holiday 5 stars but will give it 4.5 stars as I would have preferred the option of longer hikes in the mountains of Arcadia, as the trail is 75 km. 4km is not a hike more a stroll, less monasteries please and more walking in the great scenery; but all in well done to you a well organised holiday. We really enjoyed this holiday, we met lots of nice local people and were lucky to be in a small group with another family that were great fun to be with. holiday to a friend's house who takes you to all the best places in the area. Luckily for us, English is spoken widely in Greece and our guides Dimitris and Michalis (as well as Christos) spoke it perfectly. From everyone in the Hotel in Tripoli to our excellent rafting instructor - Alex, who also spoke impeccable English, we were looked after very well. A great fun holiday overall.